The Brewing Forum • View topic - Got these, what next? Picked these up today from a pub that closed down a while ago. The gas cylinder was the nicest of the lot but I have no idea of it will be any good. The cornies will need a clean inside and out. After that I'm not sure what I'll need. Re: Got these, what next? Now I'm not on my mobile I'll elaborate. Is there an idiots guide to corny kegs? 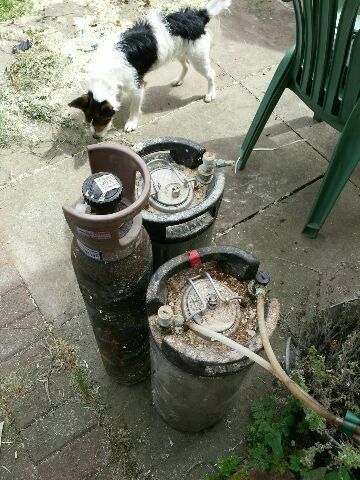 So far I have 2 kegs, a (possibly useful) c02 bottle, and that's about it. The lids look decent, and the seals look to be intact. There appear to be connections for the pipework, but they look a bit decrepit. I also have a tetley's beer tap somewhere in the house. What else do I need to get dispensing? I'm guessing some kind of silicon tubing, I've seen mention of John Guest fittings that look nice and simple to attach and detach quickly. A regulator, I've seen a few styles and was wondering what is best? Can the co2 bottle be re-used, how do I check if it's in a usable condition and where would I go for a refill? 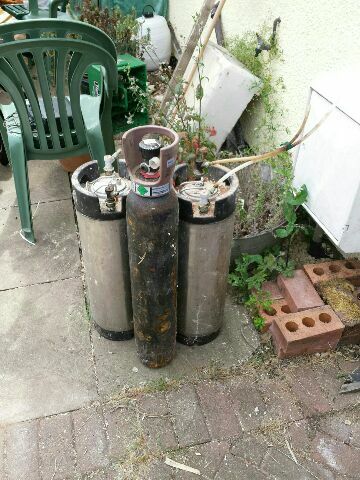 Personally I would never have touched the co2 tank, I'd never take a second hand one.. You don't know where it has come from and you might find it very difficult to get rid of..
First get a fridge, clean them up and pressure test so you need a regulator.. John guest fitting from reg to silicon tube to guest fitting into your gas ball valve..
Ball valve out to guest fitting to silicon tube to reducer guest fitting to thinner tube to another guest fitting that is the appropriate size for your tap. Bleach causes steel to corrode, I'd stick with caustic soda at 25g/L, heated to ~60C. I am assuming you have eye protection and gloves. Dismantle the keg using a spanner and soak everything for a few hours. Replace all the seals. If 'hot' caustic doesn't shift the grime, you might need to think about acid - NIPAC for brewers or nitric is the industry standard for passivation of SS, it is a controlled substance though as it can be used to make explosives. I guess phosphoric acid would work too, but let the caustic do it's job first. Bleach is fine, just rinse thoroughly and don't let it stand. An easy way to remember which disconnect is which: Grey = gas (in) and Black = Beer (out). They look to me like they are ball locks so you need to lift the collar on the disconnect and pull it off. You can easily dismantle the disconnects by undoing the screw on the top. Personally I would replace all the seals. The Tetley tap, is it a smooth flow? The most common beer line is 3/8" or 3/16" if you are serving at higher pressure. Just to complicate things, some beer taps like yours use 5/16" line but you can easily get a 3/8" to 5/16" straight john guest connector. Last edited by sledgehammer on Sun Aug 21, 2016 15:59, edited 1 time in total. Buying a 2nd use co2 bottle is a bad idea as its probably stolen.. like legs they dont get owned by the users but remain the property of the suppliers..
You may be able to get it refilled tho if you can find a local welder with a huge bottle it can be refilled from when looking for my co2 i had a couple of offers to refill when i found a bottle..
what you will need now however is some 3/8" beer/gas line (ebay or your local hbs) corny disconnects for gas(grey) and black (beer out). JG speedfit connections to connect the gas and beer lines to the disconnects . a co2 regulator and a 1/4" hosetail attachement to slip the 3/8" beerline onto and to secure with a jubillee clip. your tap will probably have a jg fitting at its rear either 3/8" 5/16" or 3/16"..
to serve without fobbinbg/foam a length of 3/16" beerline upto 5-6ft in length can be used on the beer out side to reduce the keg pressure before release at the tap to drop the pressure at the tap point to a nominal 1-2psi to help keep the condition in the beer. to clean use weak warm laundry oxi solution..
Last edited by PhatFil on Fri Sep 02, 2016 23:00, edited 1 time in total. I keep meaning to get round to the idiots guide... I promised it in 2015!